The Vital objective of this report is Suggestion to develop Customer Satisfaction complying existing rules, gather information and related data in order to combine them based on the report Name “Clearing Formalities through Bank. Other objectives of this reports are to identify the problem facing by the NCC Bank Ltd, to suggest corrective measure for the development of customer satisfaction on foreign remittance payment project, to study financial ratio analysis & trend analysis and to explain SWOT analysis of National credit and commerce Bank Limited. Now a day’s Industries as well as the Non Resident Bangladeshis and persons working outside are the real assets of the clearing business of the country. To motivate and also to ensure increased clearing flow, NCC Bank has made a number of arrangements with various exchange companies. NCC Bank considering taking steps so that the beneficiaries here in Bangladesh can receive he money at their door steps. The total amount received by Bank in 2006 was more than US $ 52.56 million. Most large clearing comes from foreign exchange business including Import and Export. Bank largely depends in its Foreign Exchange Business to ensure profitability. To look after the Business and also to ensure prompt service to the Import and Export, officers having exposure and expertise in Foreign Exchange Business have been posted both at Head Office & Authorized Dealer Branches. During 2006, the Bank handled Export and Import business to the tune of TK. 8557.03 million and TK. 17646.84 million respectively. Bank’s wide network of correspondence plays vital role in facilitating its international trading. At present, total number of correspondents is 335. With a view to facilitating home bound clearing, the Bank made arrangements with a number of exchange companies during the year. This arrangement brought significant development in clearing business. NCC Bank is going to expand this network in near future. Corporate Governance establishes specific responsibility to ensure accountability. With a view to ensuring accountability and fairness in functions of the company d also to comply with the requirements of regulatory agencies, care has been : to improve Corporate Governance. Due to these practices the remittance c of NCC Bank has been growing to provide a good participation in the of the Bank. To show the overview of the NCC Bank Ltd.
To review how NCC Bank perform their foreign remittance payment project. To know the work process and monitoring system of foreign remittance payment project. To identifying the major clients, products and others activities. To show bank, country, exchange house wise remittance statistics. To identify the problem facing by the NCC Bank Ltd.
To suggest corrective measure for the development of customer satisfaction on foreign remittance payment project. To study financial ratio analysis & trend analysis. To explain SWOT analysis of National credit and commerce Bank Limited. HISTORICAL BACKGROUND OF NCC BANK LTD.
National Credit and Commerce Bank Ltd. bears a unique history of its own. The organization started its journey in the financial sector of the country as an investment company back in 1985. The aim of the company was to mobilize sources from within and invest them in such way so as to develop country -industrial and Trade Sector and playing a catalyst role in the formation of capital market as well. Its membership with the browse helped the company to a great tent in this regard. The company operated up to 1992 with 16 branches and hereafter with the permission of the Central Bank converted in to a fully fledged private commercial Bank in 1993 with paid up capital of Tk. 39.00 cooer to serve nation from a broader platform. Since its inception NCC Bank Ltd. has commendable reputation by providing sincere personalized service to its customers in a technology based environment. The Bank has set up a new standard in financing in the Industrial, Trade and origin exchange business. Its various deposit & credit products have also attracted the clients-both corporate and individuals who feel comfort in doing : with the Bank. The main task of the NCC Bank is to accept deposited from various Customers through various accounts. Provides loans on easy terms and condition. It creates deposit. The Bank invest it fund in to profitable sector. It transfer money by Demand Draft (DD), Pay Order (P0), On-line and Telegraphic Transfer etc. The Bank is doing the transaction of bill exchange, Cheque etc. NCC Bank assists in the foreign exchange by issuing letter of credit. It brings the increasing power of the dimension of transaction. Facility for bill of exchange and by providing the facility of letter of Guarantee. (b) Paid up Capital: it’s paid up capital is Tk. 1,757.62 million. (c) Reserve fund & other fund: Reserve fund increased to tk. 2,863.62 million. (d) Performance of the bank: Deposit various setbacks in economy. Banks rformance may be termed as satisfactory in respect of deposit mobilization & profit earning. At the end of the year 2008, banks operating profit stood at tk. 363.49 million. (g) Credit Administration: The rate of classified loans during the year was 4.17%. (h) Investment: Investment figure of the bank as on 31 December 2008 stood at tk 6266.62million. (i) Foreign Exchange Business: During 2008, the bank handled Export & Import business to the tune tk. 9577.92 million & tk. 28779.21 million respectively. (m) Dividend: 30% bonus share. Automation in NCC bank Ltd. In today’s global business scenario, particularly in banking sector, technology plays a vital role in executing all sorts of customer friendly banking operations with cost efficient services, Technology has become an aide of necessary rather than option in financial institutions. Keeping this in view, the bank has already computerized all of its Branches from day one of its opening. However, under a comprehensive strategy of 3 phase state of the art automation program, the bank, in its first phase, has connected all the branches in a wide Area Network using VSAT and optical fiber connection for providing any – branch- banking services to its valued customers and the customers are enjoying any – branch- banking facility. In second phase, procurement of a centralized Shariah based Islami banking software is going on which is expected to be completed by this year and the tenure of the 2 phases is schedule to be completed within the year 2010. In 3 phase, incorporation of different electronic delivery channels like ATM, PUS, Internet banking, mobile banking etc. will be done in the year 2010. After completed of the 3 phases, the bank is expected to becoming a paperless banking organization centralizing its information collection, processing, storage and dissemination with a prime objective to provide cost effective banking service for maximizing the customer’s satisfaction through state of the are technology. Through effective Fund Management, the Bank could earn Tk. 237.79 million during the year through dealing room operation. The Brokerage House of the Bank could sustain its pace during the year under reference. It’s success inspired the Bank to open a new station at Uttara R/A during 2006. We have also plans to open at least more two stations at Banani in Dhaka and Agrabad in Chittagong in 2007. The operational profit of the Bank during 2006 was Tk 267.57 mi! !ion as against Tk, 018.34 million in 2005, rate of growth being 24.47%. Return on Assets (ROA) was l.63%. The Board of Directors has been pleased to recommend 22:50% Dividend (10% Cash, 12.50 % Bonus) for its valued shareholders for the year 2006. In Bangladesh Bank, there is a very large room, which have more tables for each bank that is called the clearing house. Every bank has an officer of clearinghouse who is work with Bangladesh Bank clearing house. Actually most of major client deposit their account in different kinds of bank cheques. Clearing officer check all the cheques and deposit slip very carefully and then he received the cheque. After that the clearing officer posting all the cheques in computer software which is recognized through Bangladesh bank computer department. Then clearing officer seal all the cheques in advance date after that the officer endorsement all the cheques and sign all the cheques. All the cheques are posted in the computer by branch wise, then officer print the entire document and staple all the cheques by branch wise this is called schedule of clearing house. According to the Article 37(2) of Bangladesh Bank Order 1972, the banks which are a member of the clearing house are called ad Scheduled Banks .The Scheduled Banks clear the cheques drawn upon one another through the clearing house. This is an arrangement by the central bank where everyday the representative of the member banks sits to clear the cheques. For clearing there is a department in every bank. This department receives cheques, drafts and like instruments from its customer for the purpose of collection with a deposit slip over the counter crediting their accounts .Clearing of cheque is done through the clearing house in Bangladesh Bank .Everyday the first hour starts at 10.30am and returns house at 5:00 pm. Inward cheques are those ones drawn the respective branch which have been presented on other banks and will be cleared / honored through the remittance house of Bangladesh Bank. Then the cheque is called inward cheque of NCC local Office. Purchaser must be an accountholder of JBL. But in special cases job seeker and student can issue a pay order from this branch. Client first deposit the money with P.O application form. Next officer give necessary entry in the bills payable register. Then prepare the P.O instrument carefully. After that it has been sign and approved by higher authority. Signature of customer is taken in the counter part of the instrument. Fin ally it delivered to the customer. A customer of Dhaka bank who is the payee a P.O. will deposit it for collection .The instrument is given to the remittance that will place it to the issuing bank in the remittance house. Before placement NCC as a collecting bank gives necessary endorsement. If we consider the present situation of our country then carrying cash is not safety and risky. For safety purpose one can use banking channel and ensure the maximum security of their money. That’s why money can be transferred from one place to another through banking channel. This is called remittance. Remittances of funds are one of the most important aspects of the commercial banks in rendering services to its customer. Sending money from one place to another place for the customer is another important service of banks and this service is an important part of countries payment system. For this service people especially businessman can transfer funds one place to another very quickly. A DD application form is given to the customer. Customer fills up the form which includes the name of the drawer, name of the payee, amount of money to be sent, name of the drawer branch, signature and address of the drawer. The customer may pay in cash or may transfer the amount from his/her account. After the money is paid and the form is sealed and signed, it is given to the DD issuing desk. DD block has two parts one for bank and another for the customer. Bank’s part contains issuing date with drawer’s name and sum of the money and name of the drawer branch. Customer’s part contains the name of the payee, issuing date, sum of the money and drawer branch. After filling up the DD, form is given in the DD issue register and at the same time the bank issue a DD confirmation slip addressing the drawer branch .This confirmation slip is entered into the DD advice issue register and a number is put on the confirmation slip from the same resister. Letter on the bank mail this slip to the drawer branch. Then the DD from is sealed with a protectoral machine to protect from material alteration. Next the customer signs on the back of the DD and takes him/her part of DD. The demand draft (DD) is a negotiable instrument under section 85(A) of the negotiable instrument act -1881. DD is issued in favor of the customer who maintains an account with this branch. Demand Draft is an order of issuing bank on another branch of the same bank to pay specified some of money to the payee on demand. It is generally issued when the customer wants to remit money in any place, which is outside the remittance house area of issuing bank. A DD application form is given to the customer. Customer fills up the form which includes the name of the drawer, name of the payee, amount of money to be sent, name of the drawee branch, signature and address of the drawer. The customer may pay in cash or may transfer the amount from his/her account. After the money is paid and the form is sealed and signed, it is given to the DD issuing desk. DD block has two parts one for bank and another for the customer. Bank’s part contains issuing date with drawer’s name and sum of the money and name of the drawee branch. Customer’s part contains the name of the payee, issuing date, sum of the money and drawee branch. After filling up the DD, form is given in the DD issue register and at the same time the bank issue a DD confirmation slip addressing the drawee branch .This confirmation slip is entered into the DD advice issue register and a number is put on the confirmation slip from the same resister. Letter on the bank mail this slip to the drawee branch. Then the DD from is sealed with a protectoral machine to protect from material alteration. Next the customer signs on the back of the DD and takes him/her part of DD. For payment of demand draft paying branch first has to confirm that the Demand Draft is not fake one. First bank check the “Test Code” mentioned on the draft. If “Test Code” agrees then believe the DD is not bogus and authority makes payment. For further confirmation the issuing bank sends an advice about the DD to the paying branch. Without advice the paying branch does not make payment. The I.B.C.A. (Inter Branch Credit Advice) dispatched to drawn on branch. Issuing an I.B.C.A. implies that the branch is being credited to whom it is issued. I.B.C.A. contain the controlling number .Lodgment is given after receiving an I.B.C.A. Necessary entry is given in a register called “DD-In-Issuing branch. Controlling number of the I.B.C.A. should match the serial number of this DD in register. If the holder of the instrument wants to cancel it, he should submit a request letter in this regard. Issuing branch then sends I.B.D.A. to the drawn on branch against the I.B.C.A. which was sent previously. In case of Demand Draft both the payer and payee need to maintain accounts. But there is no certain rule for pay order. PO is used in the same remittance area; DD is used for all kinds. DD cannot be done in the same remittance area. DD is drawn on a certain bank office. But there is on certain rules for PO. Cheque to be remittance through the transfer. When same bank or JBL has two A/C to given transfer by the “Posting” and then test the cheque for “Passing” .If the pass of the cheque then will be transfer .This process just for on line banking. Outward cheques are those ones drawn on other bank branches which are presented on the concerned branch for collection through remittance house of Bangladesh Bank. These cheques are called outward remittance cheques. External Remittance or Inter-Banks remittance. Endorsement might be Payees account credited or receive payment but in OBC chaque an endorsement will be payees account credited on realization. Open cheque: A cheque, which capable of being paid over the counter in cash, is known as open cheque. Crossed Cheque: Those, which can only be paid to the banker for crediting the proceeds to the amount of its payee. Insufficient funds / not arranged for. Drawn against uncollected funds. May be presented again. Amount in words and figure differ. Alternation requires drawer’s full signature. Cheque postdated /out of date. Payee’s endorsement required / irregular. Payee’s endorsement requires bank confirmation. Effects not cleared pls. Present Again. The entire member banks representative daily conduct two meeting at a fixed time. In their first meeting they hand over Cheques, drafts etc passed, which are drawn upon them. In case there are certain Cheques, which could not be honored the same are returned to the presenting banks with reasons of non-payments in the second meeting at the remittancehouse. In this meeting also the final position of house is prepared and respective accounts of the member banks are debited or credited depending their individual payments or collection position. After that the bankers individually debit the accounts of their customers with Cheques, which are returned unpaid. NCC sends with cheque return memo to the customer stating the reason if the cheque is dishonored. NCC Bank Limited charges some money as penalty if the cheque is dishonored because of insufficient of funds. The Bank provides better quality foreign remittance payment service to the clients compared to its other contemporary competitors. Energetic as well as smart team work. Experienced bankers and corporate personnel have formed the management of the Bank, which formulates business strategies. Some services of the Bank are automated which attracts large number of clients. Usage of faster PC and software. National Credit and Commerce Bank Limited has already achieved a goodwill among the clients that helps it to retain valuable clients. The bank does not go for rural banking. But rural people are bankable which NCCBL get from the activities of the NGOs. Sometimes create misunderstanding with NCC bank and TMSS which create remittance payment is complex. The Bank lacks aggressive advertising and promotional activities to get a broad geographical coverage. The bank has only a few ATM booths but not in mention able places. So, the scope of the use of ATM card is limited. There are few employees in FRPP section. Increasing awareness of remittance payment in rural area and assuring the remitter for their service. Scope of leading the foreign remittance payment market. Increased competition in the market. Lost expert employee by offering other bank. The banking sector in Bangladesh is now quite competitive. The private commercial banks that are currently operating in Bangladesh offering different products but there are few basic differences among them in terms of structure and performance. Thus, the competitions among them are increasing day by day. So, based on my experience & knowledge to progress in future, NCC bank must adopt some policy which will help the bank to capture a large number of clients in the market. NCC Bank could give more attention to advertisement and promotion of foreign remittance payment service, which is helpful to get more customers. Bank could use various media for advertisement like TV, News Paper, Internet and Billboard. A philosophy of working for the customers instead of working for boss must be introduced. A website should be more attractive and have more information in it. Also it should be uploaded regularly. Up to date banking software should be use to give batter service to the customers. Manpower should be increase in REMITTANCE section. Banks always contribute towards the economic development of a country. Compared with other Banks NCC Bank is contributing more by investing most of its funds in fruitful projects leading to increase in production of the country. It is obvious that right channel of Banking establish a successful network over the country and increases resources; and it plays a considerable role in the portfolio development in developing country like ours. Since inception NCC Bank has been rendering its Banking services with the needs of the nation to cope with the demands of people in the country. By doing many other works for state & society, NCC Bank has emerged as the pioneer of playing key role in the country. The foreign remittance payment service of the NCC Bank Limited is getting modernized day by day. The customers are choosing NCC Bank Limited as best foreign remittance payment services among other commercial banks. NCC Bank limited try smooth and faster their foreign remittance payment system. They try to give the best service to their customer. NCC Bank increase its customer service and the image has put excellent effect on consumer minds its customers re growing rapidly. The bank is currently doing average. By analyzing it’s performance it is served that a potential growth might be accelerated through effective implications of competitive strategies. Being an old generation bank it has an advantage compared to newly established bank in the form of wide range of ies. However strategy implication needs to be as fast as possible to grab e early mover advantage. 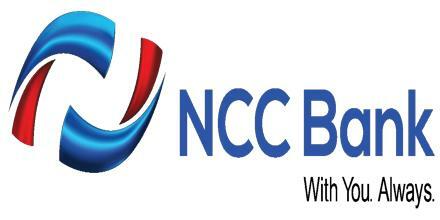 Presently NCC Bank is being treated as one of the 1 banks in other private banks in Bangladesh. NCC Bank is very concern bout the customer care and they take many steps for satisfying customer. Finally, I can say NCC Bank Limited operates their foreign remittance payment system very well comparing other bank.